Here are some snazzy birthday facts about 19th of November 1973 that no one tells you about. Don’t wait a minute longer and jump in using the content links below. Average read time of 10 minutes. Enjoy! What day was my birthday Nov 19, 1973? November 19, 1973 was a Monday and it was the 323rd day of the year 1973. It was the 47th Monday of that year. The next time you can reuse your old 1973 calendar will be in 2029. Both calendars will be exactly the same! This is assuming you are not interested in the dates for Easter and other irregular holidays that are based on a lunisolar calendar. What day is November 19 this year? There are 214 days left before your next birthday. You will be 46 years old when that day comes. There have been 16,587 days from the day you were born up to today. If you’ve been sleeping 8 hours daily since birth, then you have slept a total of 5,529 days or 15.14 years. You spent 33% of your life sleeping. Since night and day always follow each other, there were precisely 561 full moons after you were born up to this day. How many of them did you see? The next full moon that you can see will be on April 19 at 11:14:00 GMT – Friday. Fun stat: Your first one billion seconds (1,000,000,000) happened sometime on July 28, 2005. If a dog named Boudicea - a Yorkshire Terrier breed, was born on the same date as you then it will be 200 dog years old today. A dog’s first human year is equal to 15 dog years. Dogs age differently depending on breed and size. When you reach the age of 6 Boudicea will be 40 dog years old. From that point forward a small-sized dog like Boudicea will age 4 dog years for every human year. View the complete list of November 19 celebrity birthdays. Who are the famous November 19 birthdays? Here’s a short list of famous people in history who were born on Nov 19. View the complete list of November 19 famous birthdays. 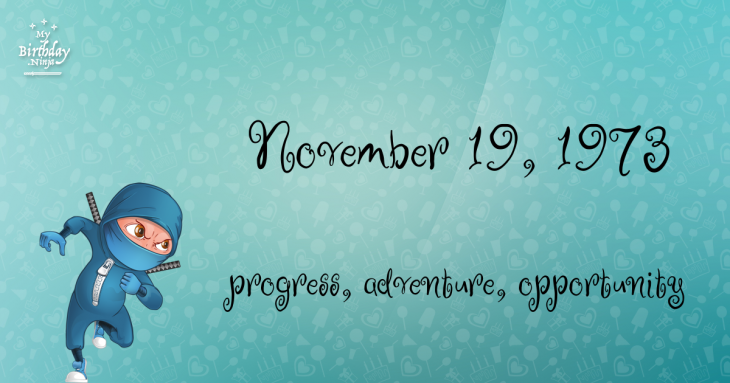 What happened on my birthday – Nov 19th? The Rashidun Caliphate defeated the Sasanian Empire at the Battle of al-Qādisiyyah in Iraq. The United States and the Kingdom of Great Britain sign Jay’s Treaty, which attempts to resolve some of the lingering problems left over from the American Revolutionary War. American Civil War: U.S. President Abraham Lincoln delivers the Gettysburg Address at the dedication ceremony for the military cemetery at Gettysburg, Pennsylvania. First Balkan War: The Serbian Army captures Bitola, ending the five-century-long Ottoman rule of Macedonia. World War II: Battle of Stalingrad – Soviet Union forces under General Georgy Zhukov launch the Operation Uranus counterattacks at Stalingrad, turning the tide of the battle in the USSR’s favor. US General Dwight D. Eisenhower becomes Supreme Commander of NATO-Europe. Télé Monte Carlo, Europe’s oldest private television channel, is launched by Prince Rainier III. Iran hostage crisis: Iranian leader Ayatollah Ruhollah Khomeini orders the release of 13 female and black American hostages being held at the US Embassy in Tehran. Shenzhou 1: The People’s Republic of China launches its first Shenzhou spacecraft. View the complete list of November 19 historical events. What does my birthday November 19, 1973 mean? 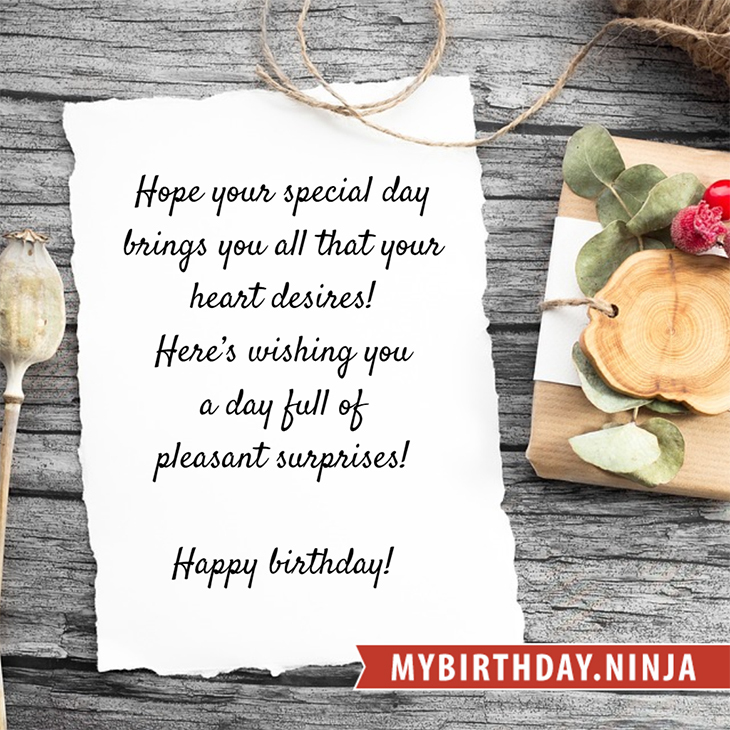 Your birthday numbers 11, 19, and 1973 reveal that your Life Path number is 5. It represents progress, adventure and opportunity. You possess the curiosity of a cat and long to experience all of life. The following celebrities also have the same life path number: Logan Miller, Don Murray, Ashlyn Sanchez, Josephine Barstow, Dwight York, Kate Ceberano, John Pleshette, Elba Ramalho, Felix Jaehn, Supakorn Kitsuwon. What is the birthday horoscope for Nov 19, 1973? The Western zodiac or sun sign of a person born on November 19 is Scorpio ♏ (The Scorpion) – a fixed sign with Water as Western element. The ruling planet is Pluto – the planet of transformation. According to the ancient art of Chinese astrology (or Eastern zodiac), Ox is the mythical animal and Water is the Eastern element of a person born on November 19, 1973. What is the birthstone for November 19? Topaz is the modern birthstone for the month of November while Pearl is the mystical birth stone (based on Tibetan origin). The zodiac gemstone for Scorpio is beryl. Lastly, the birthday stone for the day of the week ‘Monday’ is pearl. Fun fact: The birth flower for 19th November 1973 is Chrysanthemum for loveliness. What is the Love Match for Nov 19, 1973? When it comes to love and relationship, you are most compatible with a person born on November 18, 1966. You have a Love Match compatibility score of +131. Imagine being in love with your soul mate. On the negative side, you are most incompatible with a person born on June 6, 1989. Your incompatibility score is -117. You’ll be like a cat and a dog on a love-hate relationship. Arf-arf, I want to bite you. Meow-meow, stay away from me! What is a good birthday trivia for November 19? The number-one hit song in the U.S. at the day of your birth was Photograph by Ringo Starr as compiled by Billboard Hot 100 (November 24, 1973). Ask your parents if they know this popular song. I do not know how you feel about this, but you were a male ♂ in your last earthly incarnation. You were born somewhere around the territory of Central Africa approximately on 1350. Your profession was librarian, priest, keeper of tribal relics. How many babies were born on November 19, 1973? Base on the data published by the United Nations Population Division, an estimated 121,831,979 babies were born throughout the world in the year 1973. The estimated number of babies born on 19th November 1973 is 333,786. That’s equivalent to 232 babies every minute. Try to imagine if all of them are crying at the same time. What is the popular baby name on 19 Nov 1973? What’s your bizarre Florida Man story? The #FloridaManChallenge is breaking the Internet and social media. Some crazy men, women, or creatures from the Sunshine State are making headlines every day of the year including your birthday. Try this fun exercise. Pick your search engine of choice and type in “florida man November 19” and see what kind of wild news headline you will get. This viral craze started in 2013 and gets resurrected now and then. The latest was from Tumblr and found its way to Twitter. As they say, the rest is history. Here’s a quick list of all the fun birthday facts about November 19, 1973. Celebrities, famous birthdays, historical events, and past life were excluded. Try another birth date of someone you know or try the birthday of these celebrities: August 18, 1971 – Tom Middleton, English DJ and producer (Global Communication); September 24, 1950 – Harriet Walter, English actress; December 1, 1944 – Eric Bloom, American singer-songwriter and guitarist (Blue Öyster Cult).